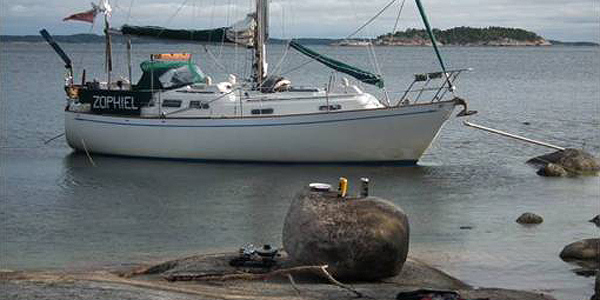 105 Rocks - Glosan - natural harbour - Sail in Finland! This was a genuinely off-piste rock on which I spent a very pleasant and quiet night, but not one that I’d recommend terribly much. 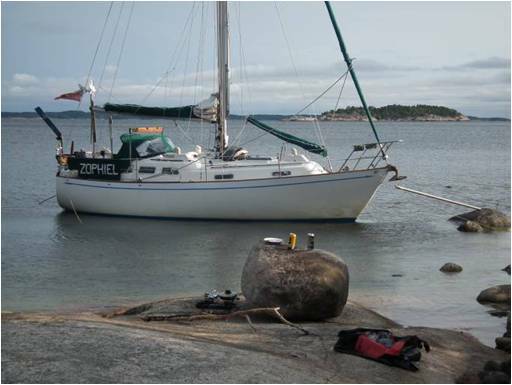 I came round here after the debacle with trying to moor and running aground in Boskar (No.88). 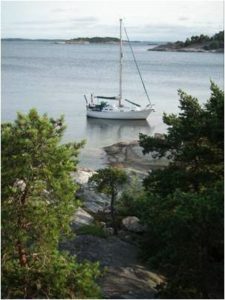 With the wind forecast to go north westerly I explored all round the little bay and tried to get ashore in a number of places. Everywhere there were underwater rocks less than a metre deep. 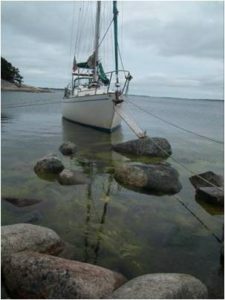 But I was getting pissed off with not being able to get ashore in this archipelago about which everyone says you can just go ashore anywhere and which is supposed to be so bloody easy. So eventually I found probably the only suitable rock, in the western corner. But it was shallow and I could only get ashore by hopping from rock to rock and engineering a sophisticated bridge using Max the Plank. 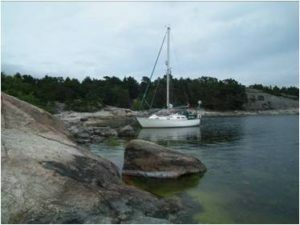 It was a very pleasant evening and I had the whole wee island to myself, but you’d want quite a shallow draft, no strong wind from the south and a degree of bloody mindedness to make this rock work. 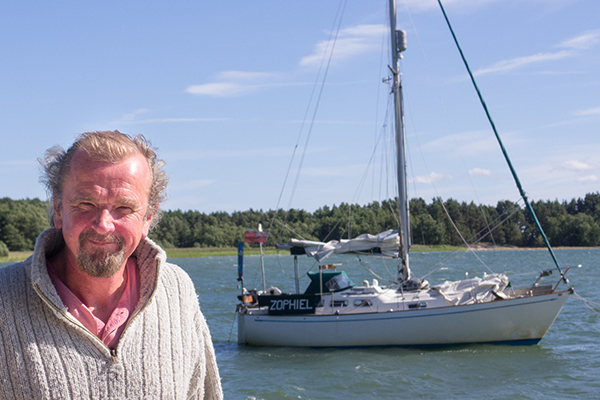 There’s probably plenty of suitable places on the surrounding islands, but there are holiday homes on the shores of some of them and you aren’t supposed to park in people’s front gardens. Boat, barbeque, Boddington’s beer, what more could you ask for? 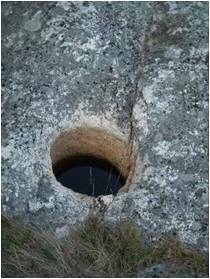 Geologists, could this be a natural hole? 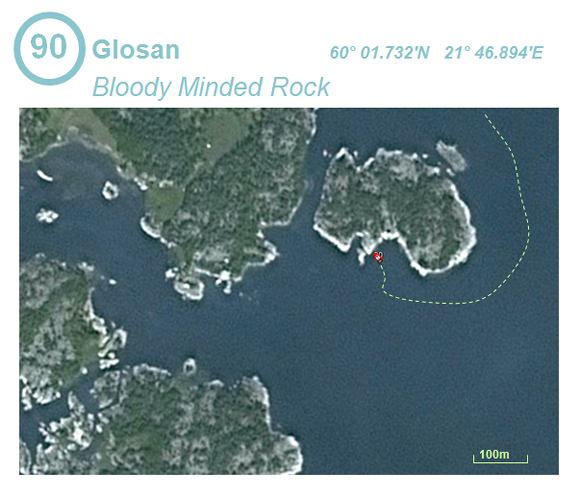 Locate Glosan on the map and find more adjacent harbours and marinas here.